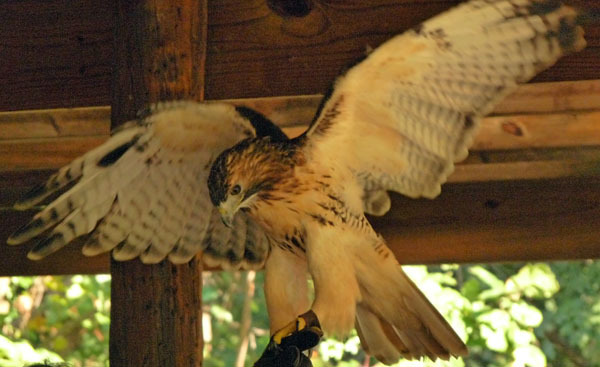 Red-Tailed Hawks - Raptor Rehabilitation of Kentucky, Inc. The Red-Tailed Hawk is very common in Kentucky, often found sitting on light poles above the Interstate. Their preferred habitat includes pastures, grasslands, and woodland edges, where they hunt for small mammals (rabbits, squirrels, chipmunks, mice, rats and voles), heavy ground birds (pheasants and grouse), snakes, amphibians and sometimes carrion. In captivity, we feed them rats, squirrel and rabbit. They are diurnal birds which spend most of their time perched, leaving it generally only to hunt (perch and pounce). They also hunt with a soar and stoop method. Sometimes pairs will work together to get a squirrel in a tree. They can spot a mouse from 100 feet, then power dive after it at speeds up to 120 mph. Adult Red Tails are recognizable by their red tails and a dark band of feathers across their white belly. 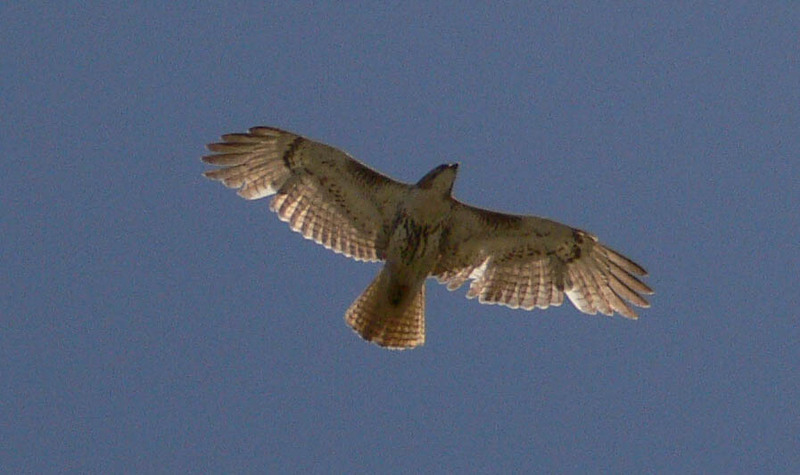 Immature Red Tailed Hawks have black bands on a brown tail. Red Tailed Hawks make a loud "kree-e-e" call often used by Hollywood as a Bald Eagle call. These hawks establish life-long pair bonds. They do not hunt or live together most of the year, but just prior to and during breeding season a pair can be seen perched together in the same tree. During courtship, the pair perform elaborate displays called sky dancing, involving dives, barrel rolls, and ascents. They even meet in the air, lock talons, and spiral downward until they part near the ground. RTH's begin working on their nest of sticks around the beginning of February, and will return to a successful nest site each year. The average clutch is 2-3 eggs, and the female does most of the incubation while the male feeds her. The young hatch after 28-32 days, and fledge at 44-46 days of age. Ginger arrived at RROKI on 2/21/93, as adult with a bright ginger-colored tail. Once they get that adult tail, you cannot tell how old the bird is. She came from an unlicensed rehabber in Hardin County, KY, where she had been shot. Both wings were broken and her body was full of shotgun pellets, and shot passed through the left eye. The rehabber did not give proper treatment, and by the time she came to us, her broken bones had already healed, so that she cannot close her wings against her body. She has gone to programs to teach school children for over twenty years. If we get Red-Tail chicks, she is also an excellent surrogate parent. Scarlett arrived at RROKI on 6/3/99 as an adult. She was admitted after being hit by a car. Although she had no broken bones, her feather shafts were split requiring her to winter over until new feathers grew in. After two full years, her feathers still did not grow in correctly, and we determined that she has damaged feather follicles. While she can fly, it's not well enough to hunt and compete against other Red Tails. Ladyhawk was found by the side of I-71 in Gallatin County on August 1, 1993, after being hit by a car. She had a detached retina and is blind in her left eye, thus not suitable for release. She was placed with KY Down Under, a small Australian/Kentucky zoo in Cave City, Ky. In 2008, KY Down Under decided they no longer wanted to emphasize Kentucky birds and offered her back to us, so after 15 years she came back. She is an unusually dark colored hawk. Grace is a leucistic Red-Tailed Hawk, with dark eyes and beak and a few brown feathers. Her genetic aberration prevents her from making the melanin necessary for brown feathers. She had been seen in the Jefferson Memorial Forest area for 15 years, successfully hunting and raising a family with her mate. She came as a rehab bird in January 2015, paralyzed from the neck down with a severe case of lead poisoning. We successfully treated her for the lead poisoning, and she did NOT have brain damage, as do most birds with lead poisoning. But she still has arthritis in her feet which would make it difficult to hunt in the wild, so we decided to keep her as an education bird.